My first recommendation for someone into candles would always be a Yankee Candle as they are great quality candles with good scent throw, and the large jar size is a great size for a gift. Scents I would recommend are ‘Vanilla Cupcake’ , ‘Vanilla Lime’ , ‘Fireside Treats’ and ‘Clean Cotton’. Wax melts are a great alternative to candles, as you can mix and match scents to create a scent that is just to your taste if you can’t find a particular fragrance in a candle. I would recommend using two different Candle Belle wax melts in this double fragrance burner (or the Yankee Candle wax tarts would work with this one too). 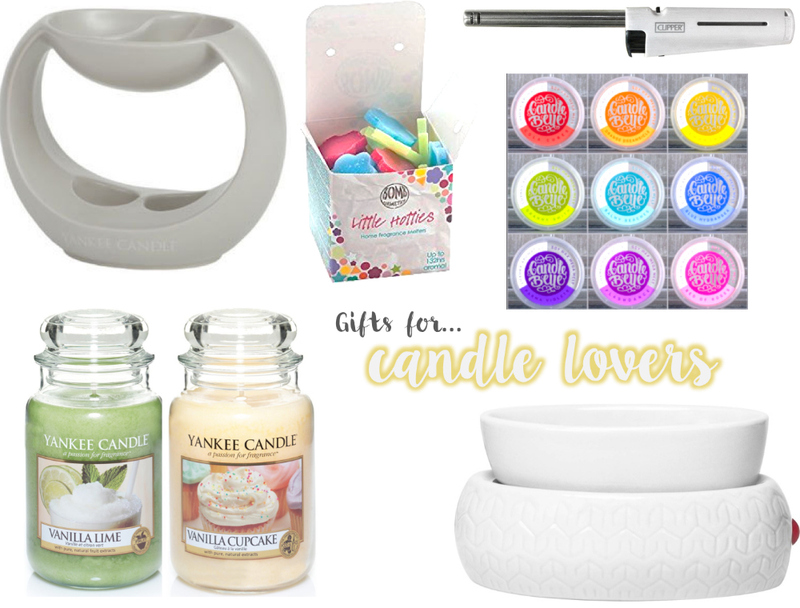 Alternatively, you could buy someone this electric wax melt burner and mix and match some ‘Little Hotties’ wax melts in it as they are quite small and you can easily mix two or three fragrances in a regular burner. Finally a little extra to go with any candle gift would be one of these candle lighters – much easier to light a candle with and safer too… no more matches burning up before the wick gets lit.